* Featrues a channeled center column with a single rear spike let enabling easy anle adjustment. * Ridged construction permits maximum support of canvas up to 34" in height. * Can be used as canvas carrier. * Overall size 17.25" W x 19" D x 25" H.
* Upper canvas support is 7'" W x 1" Deep. * Lower canvas support: 17.25" x 1" Deep. 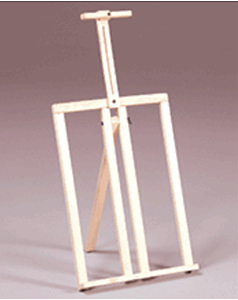 * Canvas Adjustment Angle is up to 20-degrees. 29" x 18" x 3"